I appreciate both schools of thought—and my sincere thanks to the kind souls who think I would do better (in some undefined way), if my books were alphabetized, sorted by color, arranged by height, or generally tidied into a visually pleasing (to them) formation that has nothing to do with what’s actually _in_ the books. Now, putting aside any of my private opinions regarding the psychology that causes people to value Tidiness Uber Alles, tidiness _qua_ tidiness has two possible aspects that recommend it as a virtue: aesthetics and/or function. As to aesthetics, I’ll just note that there are people who like Gustav Klimt and there are people who like Mondrian, and leave it at that. [g] Aesthetics rests on the perception of pattern, and there are patterns in total chaos (this is the basis of chaos theory). Some people like simpler patterns, some like more complex ones, and that’s fine. Now function. That’s the “How can you FIND anything in there?” response, which assumes that in fact, I can’t find anything _unless_ the books are filed according to an arbitrary pattern that the observer personally finds aesthetically appealing. OK, this is conflating the two aspect virtues of tidiness, which do not necessarily operate in correlation with each other. For an alphabetized reference system to be useful, the user has to know that the book s/he wants is written by a specific author. This in turn means that the user has to have read every word in all of the books to hand (so as to know what’s in them), and to be sufficiently familiar with them as to recognize almost any author’s content. If I had twenty books, I could do that, [g] though there wouldn’t be much point to it. As I work my way into a new novel (the one I’m writing, I mean), I begin to pick up certain books—either from the extant collection, or new acquisitions—that I think _might_ be useful as background or specific references for that project. I’ll put these references on a shelf by themselves, and add occasionally to this mini-core collection, as new thoughts occur to me or as I come across new relevant reference books. 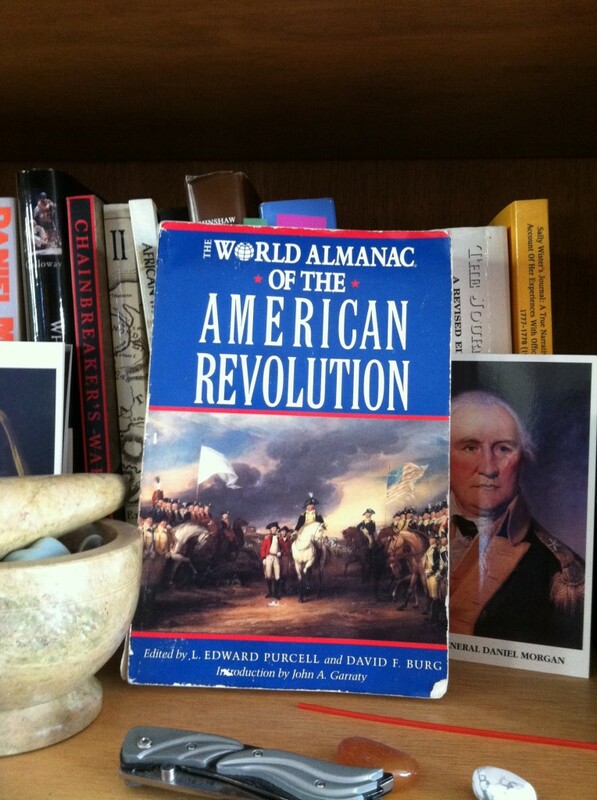 One book that’s been on the mini-core shelf for the last several Jamie and Claire books is THE ALMANAC OF THE AMERICAN REVOLUTION. This helpful reference lists and briefly describes a huge variety of the events—large and small—that occurred during the Revolution, organized by date. I use the ALMANAC not only to check dates, but to choose historical events that a) have intrinsic interest or importance historically, b) have or can have _fictional_ or dramatic significance to the people in my story, and c) are plausible to use in a geographical or chronological sense. So what happened in or near Philadelphia in the middle of July, 1778? Three very interesting things, according to the ALMANAC: 1) the British troops started to withdraw from their occupation of Philadelphia on July 15th, 2) Benedict Arnold became the military governor of Philadelphia for the Continental army on July 18th, and 3) the Battle of Monmouth took place near Philadelphia (well, near enough) on July 28th. These events can all serve my purposes. So I need to know a few things, as I work. 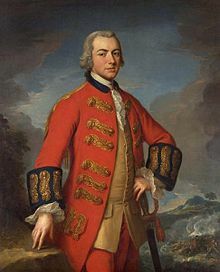 I need to know who the commander-in-chief of the British forces in Philadelphia was, what his personality and background were, and (insofar as possible) what he looked like. I need to know where Benedict Arnold was in terms of his personal political arc at that time. And I need to know what the location, order of battle, chief historical personalities present, and outcome of the battle of Monmouth was. Let’s start with the battle. If you look at the original photo of my bookshelves (at the head of the previous post), just above and behind Otis’s right ear, you’ll see a book with a yellow cover, on which the word “BATTLES” is clearly visible. I have no idea who wrote this book; it isn’t important. What _is_ important is that it’s an encyclopedia of historical battles throughout the ages. 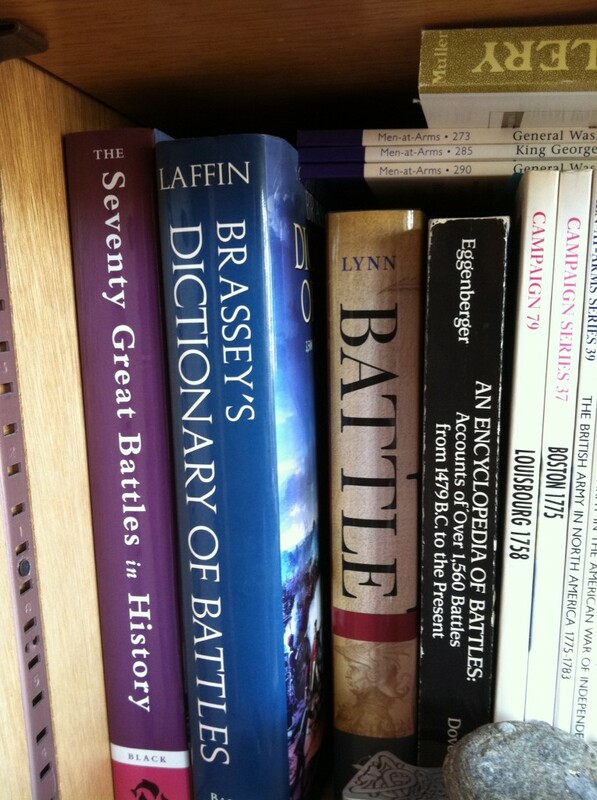 What’s also important is that it’s standing with five other encyclopedias of battle. And it’s standing on _that_ shelf, because that’s where the general-purpose military books—encyclopedias of battle, treatises on weapons and artillery techniques, Osprey Men at War books dealing with the history and equipment of relevant regiments, a novel on the siege of Havana, two books on dueling, and THE MILITARY EXPERIENCE IN THE AGE OF REASON (a survey of the military structures and operations in effect across Europe in the 18th century)—are. So when I want to know the general information about a battle (where was it, what happened, who was fighting, who won), I go to that shelf. Now, I have much more specific references that deal with the American Revolution, and there are a couple of _very_ detailed books that will give me maps and exhaustive descriptions of the Battle of Monmouth (those are in the smaller bookshelf, which you haven’t seen, and which contains most of the American Revolution-specific references)—but there’s no point reading through all that until/unless I decide that I really want to use that battle. So I start with the general reference, which tells me—among other things—that General Washington commanded the American and allied troops at that battle. Cool. Jamie/Claire et al haven’t yet met George Washington, but this might be a good opportunity. So…if, say, Jamie is going to meet George Washington, what do I (as his amanuensis) need to know about GW? I need to know what he looks like, what his overall impression (as in personality) was, and how he talked. Where will I find that sort of information? In fact, I found what color his eyes were by googling that question, but other specific information is on my mini-core shelf, in the form of ANGEL IN THE WHIRLWIND, an excellent biography of GW by an author whose name I don’t know and don’t need to know, because I know exactly where that book is. “	Jamie ducked under the lintel after Dan and found himself in a dark, shabby room that smelled of cabbage-water, grime, and the sharp reek of urine. There was one window, its shutters left open for air, and the sunlight coming in silhouetted the cropped head of a large man sitting at the table, who raised his head at the opening of the door. The big man had risen from the table, and put out a hand, smiling—though he smiled with his lips pressed tight together, as though afraid something might escape. The man was as tall as Jamie himself, and he found himself looking straight into sharp gray-blue eyes that took his measure in the instant it took to shake hands. OK. Going back to the original set of questions, plainly I need to know the particulars of Benedict Arnold’s actions, context, and state of mind when he took over as military governor of Philadelphia. Fine. 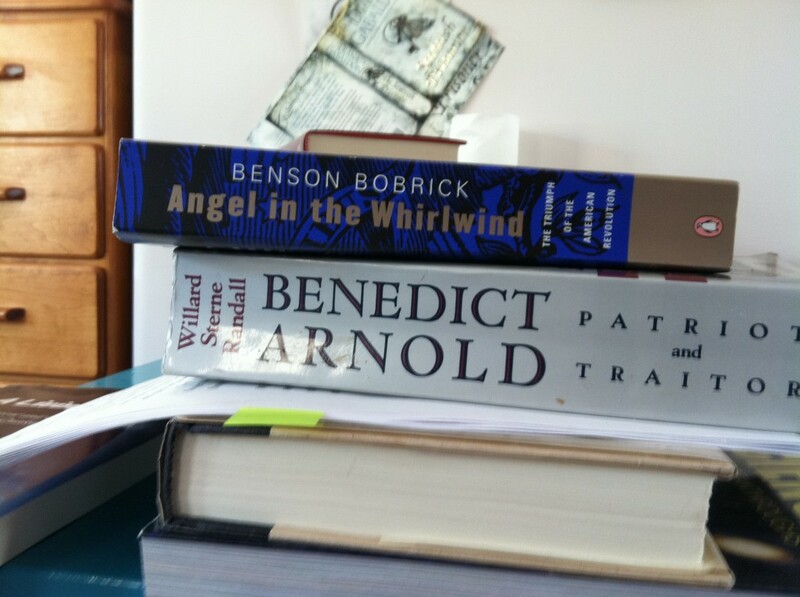 In the mini-core collection is BENEDICT ARNOLD, a very detailed and excellent biography whose author I could check by looking at the spine, but I don’t care who wrote it, only that I can find it when I need it. “	I thought I could manage the three blocks to the livery stable without incident, but at the corner of Market Street and Seventh, I was hailed by a familiar voice from a carriage window. I looked up, startled, to see the hawk-nosed face of Benedict Arnold smiling down at me. His normally fleshy features were gaunt and lined, and his usually ruddy complexion had faded to an indoor pallor, but there was no mistaking him. My heart had sped up. I’d heard from Denny Hunter that Arnold had been appointed military governor of Philadelphia, but hadn’t expected to see him so soon—if at all. I should have left it there, but couldn’t help asking, “How’s the leg?” I knew he’d been badly injured at Saratoga—shot in the same leg that had been wounded a short time before, and then crushed by his horse falling with him in the storming of Breymann’s Redoubt—but I hadn’t seen him then. The regular army surgeons had attended him, and from what I knew of their work, I was rather surprised that he was not only alive, but still had two legs. His face clouded a bit at that, but he continued to smile. “Still present, Mrs. Fraser. If two inches shorter than the other. Where are you going this morning?” He glanced automatically behind me, registering my lack of a maid or companion, but didn’t seem disturbed by it. He’d met me on the battlefield, and knew me—and appreciated me—for what I was. I knew what he was, too—and what he would become. And, not by serendipity, but by the fact that historical events form a logical nexus when people are writing about them _ex post facto_, the ALMANAC, ANGEL IN THE WHIRLWIND, and BENEDICT ARNOLD all mention that General Clinton had taken command of the British troops in Philadelphia at the time of the withdrawal, and our friend Wikipedia supplies me with a painting of the general and his birthdate (so I know how old he is in 1778. He was 48, if you’re curious; of an age to think Claire very charming). Now, if Claire—it has to be Claire, for logistical reasons—is going to talk to General Clinton, I need to know a few other things, like what she’d be wearing and how she would travel. The bottom shelf of the second bay of my shelves has the large pictorial books on historical costume, while DRESS IN 18th CENTURY EUROPE is among the books on social/cultural English/European background—these being just to the right of the encyclopedias of battle. “	By the time we’d got my hair done up in something resembling order, corralled in a cap-like snood and pinned respectably under a broad-brimmed woven straw hat, I’d come up with at least a rough notion what to tell General Clinton. _Stick to the truth as far as possible_. That was the first principle of successful lying, though it had been some time since I’d been last obliged to employ it. Well, then. A messenger had come for Lord John—one had—bringing a note—he did. I had no idea what was in the note—totally true. Lord John had then left with the messenger, but without telling me where they were going. Also technically true; the only variance being that it had been a different messenger. No, I hadn’t seen in which direction they had gone; no, I didn’t know whether they had walked or ridden—Lord John’s saddle-horse was kept at Davison’s livery on Walnut Street, two blocks away. That sounded well. If General Clinton chose to make inquiries, I was reasonably sure he’d discover the horse still in its stall, and thus conclude that John was somewhere in the city. He would also presumably lose interest in me as a source of information, and send soldiers round to whatever haunts a man such as Lord John Grey might be supposed to be visiting. Beginning to see how this works? For me, that is. I imagine some of the tidier-minded writers of historical fiction actually spend years poring through their references, tidily transferring bits of information to index cards (or their electronic equivalent) so that they could instantly look up “women’s clothing,” “Revolutionary War battles,” “George Washington, physical appearance,” and the like. If that suits the way they work, great. Anything that helps you get words on the page is the right thing to do. This is just how _I_ do it. I’ve fantasized about the Reverand Wakefield’s study, and his bulletin board; slips of paper and odd bits of memorabilia, tacked and stacked. Now I know where he gets it from. ;D (duh) I rescind my previous offer to organize your office. Where I mistook disorder, I now (clearly) see order. I only had to step inside the mind of a magic-maker. Thank you for leaving the bread crumb trail. Thanks for the lastest posts! I always come to your web site when I want to read somehting interesting and funny! By the way, what really amazes me is the incredible amount of books you have!!! I’m quite envious! I love the way you explain how you work,thank you. I have been an avid reader since i was ten years old & tried to read every book in the local library. I would take a book from all different parts of the library & read them even tho I did not understand them.I remember my mother asking me if I really enjoyed Popular Mechanics. ha. Thank you! Only you could call this a wonderful essay a “brief footnote.” My research methods are much the same, although considerably less effective. Brief – hahahahaha. Love it! Whatever works for you. Whatever environment inspires enough to keep the story going. That is what is important. Some of us like Klimt and Mondrian. I keep my reference by topic and my leisure reading by author. How else could you find what you need. When you have a sudden thought you want to go directly to it, not hunt around hoping you remember. 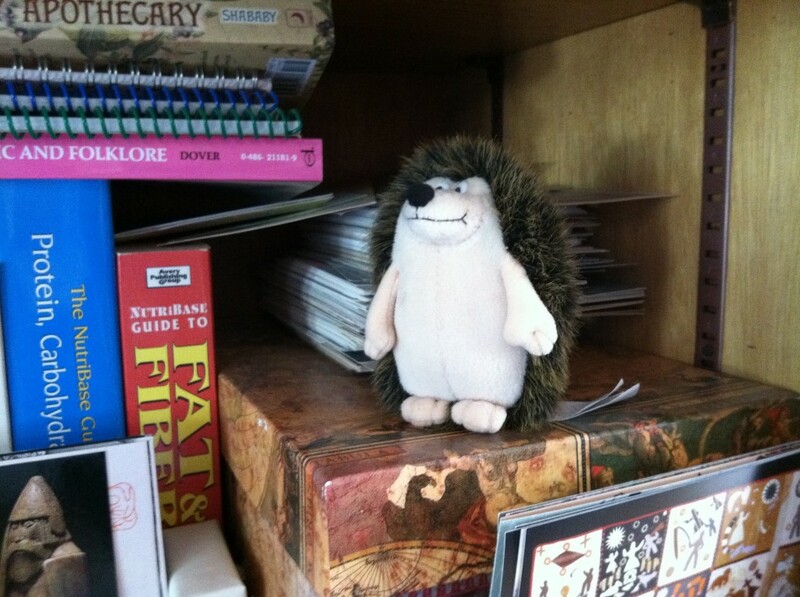 I love the Hedge Hoggggg in the first picture!! I want of those, he’s adorable. I love your books shelves. I could really get lost in those. So many cool things intermixed with the books. I thought I was the only one who put Cool Stuff on the shelves with my books Though my shelves look a lot like that, I still know just where to go to find a certain book, so it works for me. Love your books and have them in paper and e-books. Browsing your twitter I saw a new book that I was not aware of ot “A Trail of Fire” four stories of the Outlander series. When did it came out and were can I find it?. Regarding Yari’s comment about American history: I’ve often said that the reason I’ve preferred World History most of my life is that elementary school didn’t have six years to nearly convince me that it was boring. Fortunately, I had a wonderful seventh grade history teacher who showed me there was more to the subject than I thought. Maybe things have improved these days, but in those days we were taught the same core events, usually organized by holiday, year after year. What was taught did not grow as we did. The content in sixth grade was little different than in the first, except the vocabulary was more mature. Now, I still prefer world history but as time has passed the gap has gotten narrower. I wish I had read your books when I was younger. I many thanks for sharing this good information. I always want in addition to love reading quality contents. Keep sharing. Best wishes for your own further efforts.